America is having conversations about varying sources of inequality—we’re talking about how gender, race, economic status, or citizenship status can shape life trajectories and what the public response should be. We have become accustomed to hearing about “disruptions” or changes that create new opportunities, new challenges, and essentially, a new normal, but the topic of aging isn’t coming up in any of these conversations. Americans hear little about aging as a matter that requires a public response, and even less about ageism—discrimination based on age. Knowing this, eight leading national organizations on aging, including ASA and AARP, came together in 2014 to change the way Americans think about aging through the Reframing Aging Initiative. As research partner for #ReframingAging, the FrameWorks Institute conducted an investigation combining theory and methods from different social science disciplines to realize recommendations for reframing the national dialogue about aging. Their research shows aging is misunderstood in America and, moreover, those misperceptions and stereotypes lead to discrimination against older people in many areas of life, from health care to the workplace. Gaining Momentum, a toolkit prepared by the FrameWorks Institute, aims to correct popular myths and misconceptions about older adults while highlighting the importance of word choice and context when communicating about aging. Longstanding narratives perpetuated by the news and popular media lead many people to subconsciously assume that stereotypes about older people are true, with even well-intentioned profiles of older Americans pushing the idea that the aging process is something to be resisted or battled instead of embraced. Staying on Frame in Real Time: A list of common questions with guidance to help keep answers "on frame"
ReFrame cards to help advocates find the right metaphor and structure for reframed communications about aging. In this lecture series, you’ll get a guided tour of how to use new, evidence-based framing strategies to communicate more powerfully about aging as a social policy issue. Sponsored by Grantmakers in Aging, ASA, AARP and five other leading aging organizations. The nine-part series of lectures, which includes an introduction by Frameworks Institute CEO Nat Kendall-Taylor, is free through May 31, 2019, but you must register a profile through the Frameworks Academy. After adding the course to your cart, click checkout and fill out your personal information. After you click "Continue to Payment Method" to submit your info, you should see an image indicating "Your order is free. No payment is required." You'll receive your course registration instructions via email shortly after submitting and the course is immediately available. In the first training video, FrameWorks CEO Nat Kendall-Taylor welcomes you to the lecture series, shares the history and goals of the Reframing Aging Initiative, and offers a few key considerations about framing. Register & begin reframing today! The Reframing Aging Project is an initiative by the Leaders of Aging Organizations, which includes the American Society on Aging, AARP, the American Federation for Aging Research, the American Geriatrics Society, the Gerontological Society of America, Grantmakers in Aging, the National Council on Aging, and the National Hispanic Council on Aging. Together they represent and have direct access to millions of older adults and thousands of individuals working in aging-related professions. The project is funded by AARP, Archstone Foundation, The Atlantic Philanthropies, the Endowment for Health, The John A. Hartford Foundation, the Fan Fox and Leslie R. Samuels Foundation, The Retirement Research Foundation, Rose Community Foundation, and The SCAN Foundation. The initiative is managed by Laura Robbins of Laura A. Robbins Consulting, LLC. Read John Feather's article exploring the Gaining Momentum toolkit for The Huffington Post. VIDEO: Julia Sweetland of the FrameWorks Institute gives an overview of the ideas informing the Reframing Aging Initiative. Aging, Agency, and Attribution of Responsibility: Shifting Public Discourse about Older Adults (2015), the second report from the FrameWorks Institute, compares media and advocacy organizations’ narratives about aging and older adults. and how these professionals tell them. A central finding is that most information about aging in both media and advocacy is not organized as complete narrative, and is thus less likely to deepen public understanding. Gauging Aging: Mapping the Gaps Between Expert and Public Understandings of Aging in America (2015), the first report by the FrameWorks Institute, lays the groundwork for a larger effort to develop a new, evidence-based narrative around the process of aging in our country and the needs and contributions of older adults. Nat Kendall-Taylor and Moira O’Neil, both of the FrameWorks Institute, discuss results and recommendations of the initial FrameWorks research, with analysis of how the media and organizations frame topics related to aging. With Laura Robbins, Laura Robbins Consulting, LLC. Moderator: John Feather, CEO of, GIA. Presenters: Jolene Fassbinder, Archstone Foundation; Nathaniel Kendall-Taylor, FrameWorks Institute; Laura Robbins, Laura A. Robbins Consulting, LLC. 2015 State of Aging address by John Feather, PhD, in which he discussed the ReFraming Aging initiative. 2016 State of Aging address by John Feather, PhD, also discussed the ReFraming Aging initiative. 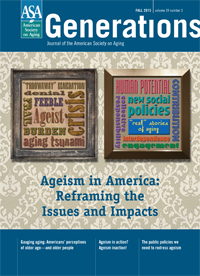 The Pernicious Problem of Ageism: special themed edition of Generations, the journal of the American Society on Aging, published in October 2015 and focusing on ReFraming Aging. Featured writings from many thought leaders on aging, including John Feather and Laura Robbins. John Feather's presentation at ASA’s 2016 conference on ageism and ReFraming Aging.